A reasonably clear night (with some intermittent cloud, but nicely transparent in between), prompted me to get the 8″ LX90ACF out, and slap the ZWO ASI120MC in the back and capture some photons reflected off out nearest rocky neighbour approximately 2.6 seconds before (Yes! 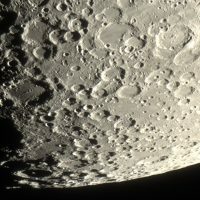 it takes 2.6 seconds approximately for light to get to your eyes from the moon 238,000 miles away(ish). I decided to set up using the iMac, running Windows in a virtual machine, out on the patio, rather than use the laptop for a change. I sent the scope slewing to Sirius, and used the trusty Bahtinov mask to focus. 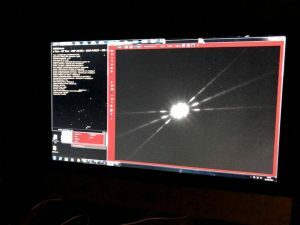 A Bahtinov mask is a special slotted mask that goes over the front of the scope, and changes any point of light (a star generally) into three diffraction lines. Focusing causes the central line to move left and right between the other two, and centralising it means that your image is perfectly in focus. 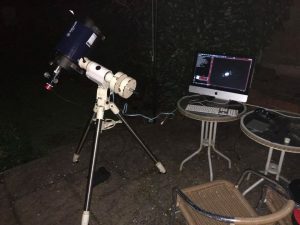 This is a great way to get your focus bang-on for any type of astronomical imaging. This is vital (along with good collimation of your telescope), for getting the best quality images you can get. 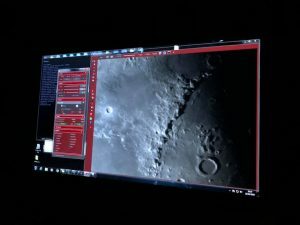 Even the live views on that night were some of the best I’d had, with amazing detail coming out of the lunar landscape on-screen. A session of roving around the lunar surface, occasionally capturing in Firecapture (generally 1500 frames per capture) left me with the usual multi-10-Gigs of video files to trawl through. Picking out the best ones, I processed in Autostakkert2 to stack the best 80% or so in each case, then imported into Registax to process further with the ‘wavelets’ function to sharpen and draw out the detail. 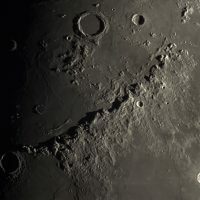 Top left is the Lunar Apennine mountain range (about 600km, or 370 Miles long, and up to about 5000m high), with crater Archimedes (83km/52 Miles wide and 2100m deep) to the north. 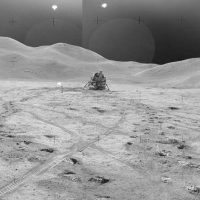 You can see the shadows of the mountains on the lunar surface as the sun rises over them. 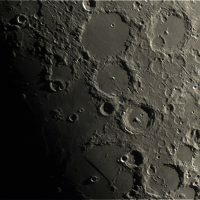 Top right image is the Lunar Alps. 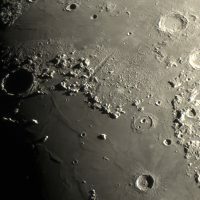 Valles Alpes (166km or 103 miles long) cuts a slash through the mountain range, with craters Plato (109km/67miles wide) to the west and Aristotle (87km/54 miles wide) to the north-east. The bottom right image shows the crater triplet of (from the top down) Ptolemaeus(153km/95 Miles), Alphonsus (119km/74 Miles) and Arzachel 96km/60 Miles). I have a particular soft spot for this area, as it was the first area I ever saw through my tiny first scope, and I remember loved the look of the interlocking craters, and the terraced walls and central peak of Arzachel. Finally in the bottom left, the heavily cratered Southern Polar region. Too many craters to name here, but the large one near the bottom left in shadow is Moretus (114km, about 71miles wide), and I think it’s cool that you can see it’s central peak poking out into the sunlight as the sun rises over the crater. The big one north of Moretus is Clavius, which is bigger at about 225km (139miles) wide. An interesting point is that the top-right Apennine region is where Apollo 15 landed in 1971. The images below show the sire. labelled on my image, along with a surface-level shot of the Lunar Lander, taken by the astronauts (as my scope isn’t quite up to this yet…!). This will be the last use of my trusty ASI120MC, as I recently upgraded to a USB3 ASI224MC, which has lower noise, and a much higher frame rate. I’m looking forward to testing this out on my next lunar or planetary imaging session… watch this space!